Have you seen this book - Ribbon Embroidery and Stumpwork by Di van Niekerk? I love the embroidery designs and stitches, particularly as they involve ribbons... The photographs are beautiful, the instructions are clear, and the project, illustrated on the cover of the book, is to die for! Stumpwork is another reason why I purchased this book. I would love to incorporate it in my embroidery projects. It is great how we can cover beads with ribbons to form flowers, stuff embroidered motifs so they can have added dimension to them, and padded shapes. 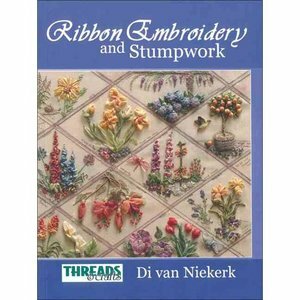 Anyway, if you are into embroidery, this book is a great find!